Sale comments: An enthusiastic crowd was on hand to push the Curracabark Herefords sale along to a strong $7521 average, with a total clearance. Topping the sale was an Allendale Anzac E114 son Curracabark Northern Lights N003 which made $30,000 selling to Guy & Suz Lord from Branga Plains, Walcha. Five Anzacs E.T brothers sold from $10-$30,000 to average $15,000. 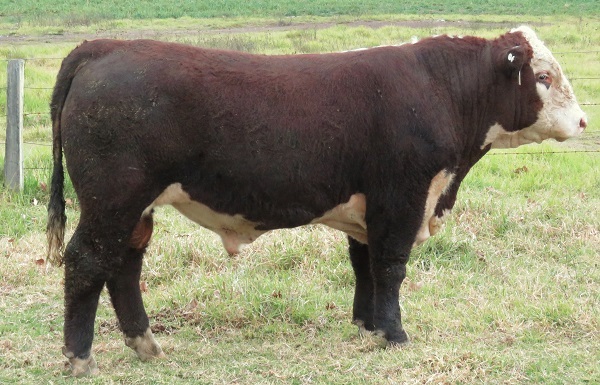 Ellerston Station was a strong supporter looking for mountain bred beef bulls and purchased 8 bulls with an average of $6,200. Great support saw bulls going to Nowendoc, Scone, Gloucester, Dungog, Buladelah, Singleton, Kempsey, Walcha and Wingham. Curracabark Northern Lights N003 sold for the top price of $30,000 to Guy and Suz Lord, Branga Plains, Walcha.